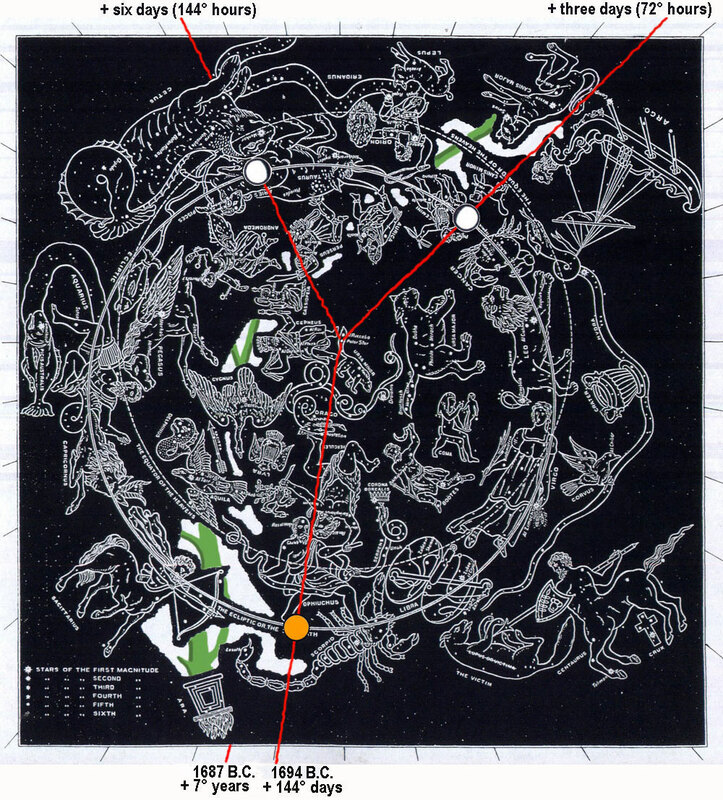 Genesis chapters 32-33 Star Chart: Clockwise from when "Jacob sent (Gemini) messengers before him to Esau his brother unto the land of Seir, the country of Edom" (32:3) in 1694 B.C. till he "took of that which came to his hand a present for Esau (Hercules) his brother ... goats ... rams ... camels ... bulls ... asses ... For he said, I will appease him with the present that goeth before me, and afterward I will (lunar eyes) see his (Hercules) face; peradventure he will accept of me" (32:13-20) is six days or 144° hours. From then till "Esau (Hercules) ran to meet him, and embraced him, and fell on his neck, and kissed him: and they (Gemini) wept" (33:4) (glistening stars rotate down) is three days or 72° hours more. 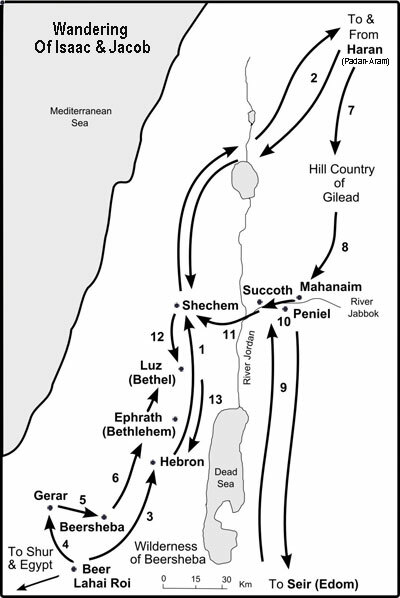 From then till "Jacob journeyed to Succoth, and built him an house, and made (red radius) booths for his (Taurus) cattle: therefore the name of the place is called Succoth" is 144° days more in 1694 B.C. "I took your birthright and blessing Esau. Now you take my blessing. You were made my servant. Now I am showing you that I am your servant." 32:1 And Jacob (Ophiuchus) went on his way, and the angels of God met him. 3 And Jacob (Ophiuchus) sent (Gemini) messengers before him to Esau (Hercules) his brother unto the land of Seir, the country of Edom. 5 And I have (Taurus) oxen, and asses, (Aries) flocks, and (Gemini) menservants, and (Gemini) womenservants: and I have sent to tell my lord (Hercules), that I may find grace in thy (lunar eyes) sight. 6 And the (Gemini) messengers returned to Jacob (Ophiuchus), saying, We came to thy brother Esau (Hercules), and also he cometh to meet thee, and four hundred (Gemini) men with him. 8 And said, If Esau (Hercules) come to the one company, and (Perseus) (red radius) smite it, then the other company which is left shall escape. 10 I am not worthy of the least of all the mercies, and of all the truth, which thou hast shewed unto thy servant; for with my (red radius) staff I passed over this (Milky Way) Jordan; and now I am become two (red radius "Y") bands. 11 Deliver me, I pray thee, from the hand of my brother, from the hand of Esau (Hercules): for I fear him, lest he will come and (Perseus) smite me, and the mother with the (Gemini) children. "A man's gift makes room for him And brings him before great men" (Prov. 18:16). 15 Thirty (Taurus) milch camels with their (Aries) colts, forty (Taurus) kine, and ten (Taurus) bulls, twenty (Aries) she asses, and ten (Aries) foals. 16 And he delivered them into the hand of his (Gemini) servants, every drove by themselves; and said unto his (Gemini) servants, Pass over before me, and put a space betwixt drove and drove. 17 And he commanded the foremost, saying, When Esau (Hercules) my brother meeteth thee, and asketh thee, saying, Whose art thou? and whither goest thou? and whose are these before thee? 18 Then thou shalt say, They be thy servant Jacob's (Ophiuchus); it is a present sent unto my lord Esau (Hercules): and, behold, also he is behind us. 19 And so commanded he the second (red radius line), and the third (red radius line), and all that followed the droves, saying, On this manner shall ye speak unto Esau (Hercules), when ye find him. 20 And say ye moreover, Behold, thy servant Jacob (Ophiuchus) is behind us. For he said, I will appease him (cover his face) with the present that goeth before me, and afterward I will see his (Hercules) face; peradventure he will accept of me. 22 And he rose up that night, and took his two (Gemini) wives, and his two (Gemini) womenservants, and his eleven (Gemini) sons, and passed over the (Milky Way) ford Jabbok. 23 And he took them, and sent them over the (Milky Way) brook, and sent over that he had. 25 And when he saw that he prevailed not against him, he (red radius) touched the hollow of his thigh; and the hollow of Jacob's thigh was out of joint, as he wrestled with him. 28 And he said, Thy name shall be called no more Jacob, but Israel: for as a prince hast thou power with God (Hercules) and with (Gemini) men, and hast prevailed. 30 And Jacob called the name of the place Peniel: for I have seen God face to face (Ophiuchus facing Hercules), and my life is preserved. 31 And as he passed over Penuel the sun rose upon him (sun on red radius horizon line), and he halted upon his thigh. 32 Therefore the (Gemini) children of Israel eat not of the sinew which shrank, which is upon the hollow of the thigh, unto this day: because he touched the hollow of Jacob's thigh in the sinew that shrank. 33:1 And Jacob (Ophiuchus) lifted up his eyes, and looked, and, behold, Esau (Hercules) came, and with him four hundred (Gemini) men. And he divided the children unto Leah, and unto Rachel, and unto the two (Gemini) handmaids. 2 And he put the (Gemini) handmaids and their (Gemini) children foremost, and Leah and her (Gemini) children after, and Rachel and Joseph (Gemini) hindermost. 3 And he (Ophiuchus) passed over before them, and bowed himself to the ground seven times, until he came near to his brother. 4 And Esau (Hercules) ran to meet him, and embraced him, and fell on his neck, and (red radius) kissed him: and they wept (glistening stars rotating down the horizon). 5 And he lifted up his eyes, and saw the (Gemini) women and the (Gemini) children; and said, Who are those with thee? And he said, The (Gemini) children which God hath graciously given thy servant (Ophiuchus). 6 Then the (Gemini) handmaidens came near, they and their (Gemini) children, and they bowed themselves. 7 And Leah also with her (Gemini) children came near, and bowed themselves: and after came Joseph near and Rachel, and they bowed themselves. 8 And he (Hercules) said, What meanest thou by all this (Taurus-Aries) drove which I met? And he (Ophiuchus) said, These are to find grace in the sight of my lord. 9 And Esau (Hercules) said, I have enough, my brother; keep that thou hast unto thyself. 10 And Jacob (Ophiuchus) said, Nay, I pray thee, if now I have found grace in thy sight, then receive my present at my hand: for therefore I have seen thy face, as though I had seen the face of God, and thou wast pleased with me. I took your birthright and blessing Esau. Now you take mine. You were made my servant, now I call myself your servant. When Jacob gave such generous gifts, it was his way of saying to Esau he was sorry and when Esau accepted the gifts, it was his way of accepting Jacob and saying he was forgiven. 13 And he said unto him, My lord (Hercules) knoweth that the (Gemini) children are tender, and the (Aries) flocks and (Taurus) herds with young are with me: and if (Gemini) men should overdrive them one day, all the flock will die. 14 Let my lord, I pray thee, pass over before his servant: and I will lead on softly, according as the (Taurus) cattle that goeth before me and the (Gemini) children be able to endure, until I come unto my lord unto Seir. 15 And Esau said, Let me now leave with thee some of the (Gemini) folk that are with me. And he said, What needeth it? let me find grace in the sight of my lord. 17 And Jacob journeyed to Succoth, and built him an (red radius) house, and made (red radius) booths for his (Taurus) cattle: therefore the name of the place is called Succoth. 18 And Jacob came to Shalem, a city of Shechem, which is in the land of Canaan, when he came from Padanaram; and pitched his (red radius) tent before the city. 19 And he bought a parcel of a field, where he had spread his (red radius) tent, at the hand of the (Genesis) children of Hamor, Shechem's father, for an hundred pieces of money.